Here’s a blog from me on World Malaria Day. You can also read it on the Huffington Post website. Malaria affects over half the world’s population, with a child dying every minute from the disease. In the worst-affected countries malaria has a devastating impact on health systems and economies. When faced with these stark facts it can often seem like there’s no hope. But amongst the gloom there are genuine signs that we may finally be winning the battle against malaria. Across the world malaria is on the decline. Over the past decade governments, NGOs and multilaterals like the UN and World Bank have come together to fight the disease, while national governments in the worst-hit countries made real progress in delivering malaria control programmes. This global coalition had an enormous impact. By 2010, 145 million bed nets – the simple, cheap yet hugely effective defence against malarial mosquitoes – were being delivered to sub-Saharan Africa. The amount of artemisinin-based combination therapies (ACTs) – the most effective pharmaceutical treatment for malaria sufferers – jumped from just 11 million in 2005 to 278 million in 2011. In just one country, Mozambique, DFID’s support for anti-malaria spraying has seen a dramatic reduction in deaths and hospital admissions of at least 40%. The effect of these efforts can be summarised in just two hugely important statistics. Between 2000 and 2010 global malaria mortality rates dropped by 26%, saving over a million lives. Behind these statistics lies hundreds of thousands of families free from pain and suffering. Free from having to mourn the death of a child. Free to get a job and work themselves out of poverty without having to worry about another bout of fever. Yet there is a danger that this anti-malaria coalition is fragmenting. Global funding for malaria is levelling off and is in danger of falling in the coming years, threatening the reversal of a decade of progress. The international community needs to sustain its support to make sure the gains made do not go to waste. This must be matched by increased commitments from the governments of high-burden countries. 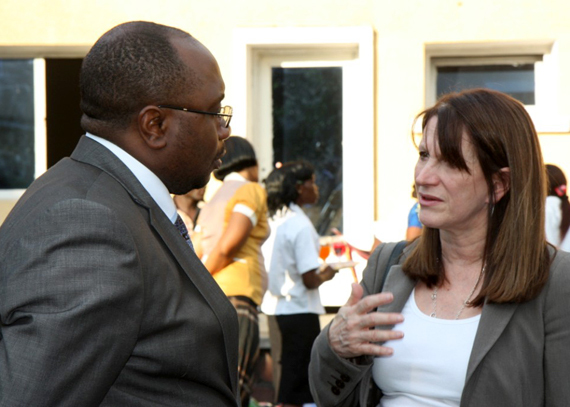 International Development minister Lynne Featherstone with Félix Kabange Numbi Mukwampa, the minister of Health in the Democratic Republic of Congo. Picture: DFID. We are doing our bit. I’m in the Democratic Republic of Congo this week, one of the worst-affected countries in the world. Here malaria is responsible for a third of all deaths and 97% of people live in high risk areas. Children under five experience an average of between six to ten episodes of malaria per year. That’s why today, on World Malaria Day, I am announcing a major new UK anti-malaria programme that will protect around six million people in the DRC from the disease and result in approximately 2.5 million fewer episodes of malaria amongst children under five every year. The UK will not stand on the sidelines while millions suffer from this entirely preventable and treatable disease. It’s time for the international community to come together yet again and keep up their commitments. We need another decade of action against malaria. The prize could be another million lives saved.